As of 2017, over 19 million Africans lived outside their country of birth but still within the continent. An additional 17 million Africans have migrated from the continent since birth. The bulk of these emigrants have gone to Europe (55 per cent) and to Asia (26 per cent), mostly the Gulf States. While this inter-continental emigration is driven mostly by countries in Northern Africa, in both Eastern Africa and Western Africa, migration is primarily contained within the region: Around 70 percent of migrants in each area stayed within the same region. Africa has the largest share of children among its migrant population – over one in four immigrants in Africa is a child, more than twice the global average. The share is particularly large in Western and Eastern Africa, where in countries like Nigeria, Ethiopia, and Kenya children account for more than 40 per cent of the immigrant population. These countries also host some of the largest child migrant populations in Africa in absolute terms – the largest housed by South Africa with 642 thousand migrants under the age of 18 in 2017. At the end of 2017, 7.4 million refugees originated from African countries – 2 million more than the previous year, and children are disproportionately represented among them. Some 57 per cent of all African refugees are children – totaling more than 4 million (as of the end of 2017). 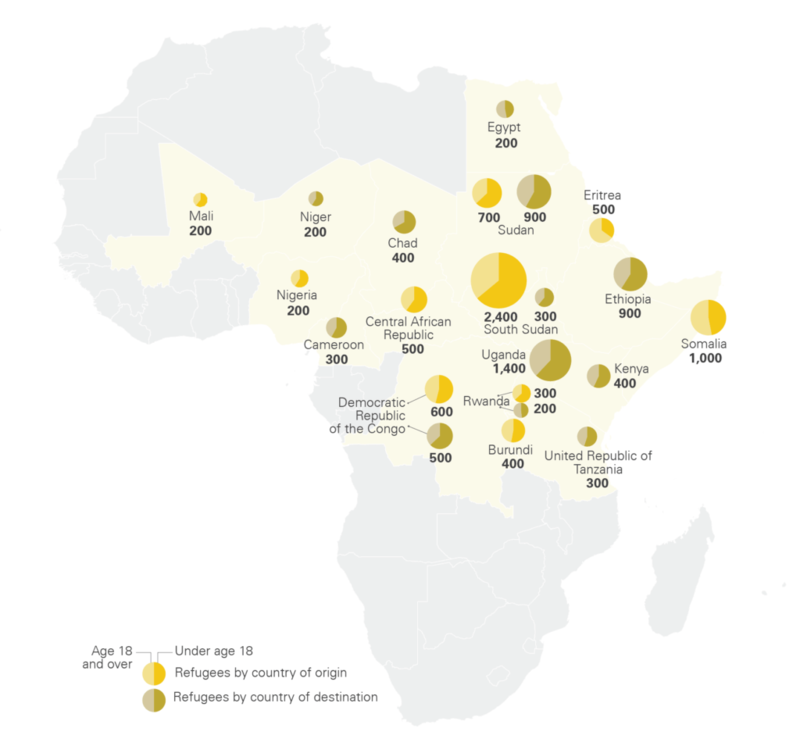 The largest numbers of African child refugees come from South Sudan, followed by Somalia, Sudan, the Democratic Republic of the Congo and Central African Republic. In total more than 14 million persons are internally displaced in Africa due to conflict and violence, half of them are estimated to be children. The Democratic Republic of the Congo alone holds 4.5 million of the internally displaced persons at the end of 2017. In 2017 alone, 4.7 million persons got newly displaced within their own country representing 40 percent of the new replacement globally for that year. UNHCR counted over 500 thousand former refugees and 1.3 million internally displaced persons (IDPs) having returned to their homes during 2017 – though, the actual numbers may be significantly higher. Nigeria and Sudan alone accounted for 380 thousand returnees. For most countries, the number of returning formerly displaced children is not available. But similar movements included 80,000 children returning from Angola to the Democratic Republic of the Congo during the last months of 2018 alone – all in need of humanitarian assistance.